Tartar sauce? I always thought that tartar sauce was what you got in a jar that was vinegary and had sweet pickles which always tasted a bit rancid. That is, until I had lunch at High West in Park City, Utah recently. I ordered the “Utah trout salad”. The trout was crispy and fresh, something I can never achieve at home when I cook our local North Carolina trout, and was on a bed of spring lettuce. On the side by the trout was a mound of something which was simply delicious. I asked the waiter what it was and he checked with the kitchen. He came back and said, “tartar sauce”. Yeah, right, I thought. No way! Curious, when I got home I checked several sources for tartar sauce and thought, “What do you know? It was tartar sauce!” But not like any I had ever tasted. As is typical of standard recipes there are a jillion variations on the theme. Usually one or two ingredients can be found in all the recipes but in general the ingredients and their ratio vary with every one. Such was the case when I went in pursuit of the tartar sauce which would approximate the one at High West. There were capers, and then there wen’t. But, mostly there were capers. There were pickles – little dills, and sweet, but mostly little dills. There was onion and then garlic was mentioned, but most recipes included onion. There was hard boiled egg, and then not. BUT THERE WAS ALWAYS MAYONNAISE. So starting with mayonnaise, I experimented with the ingredients that appeared most in the recipes I found and thought about the ratios I would use. 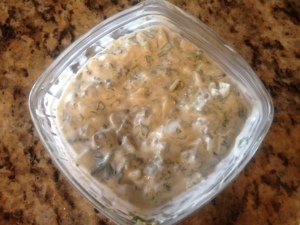 The following is my version of tartar sauce which, Hey! it turned out as delicious as I remembered it being at High West. Slice the onion very thin, about 1/8″, and then chop it. Slice the little pickles and then chop them. Chop the capers a bit. The ingredients are better if they are uniformly chopped. Add all of the ingredients to the mayonaise, stir, and refrigerate for at least an hour to let the flavors meld. Note: Little dill pickles are chunkier than hamburger dill slices. They work better in the tartar sauce.